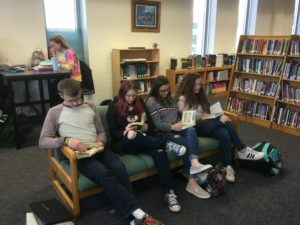 Students snuggle up in cozy chairs. A group of girls in the back sit at high top tables resembling those found in a coffee shop rather than a school library. I walk in with a canvas bag filled with books and begin pulling out one after the other, placing them on an end table. After introductions and a discussion of how we choose books, I share The Sun is Also a Star by Nicola Yoon. Our time together feels less like a class period and more like an informal gathering of readers talking books. My coaching role recently expanded to include high school and being that I have never taught this age group, the world of English class is new territory for me. It was my friend and fellow literacy coach Jill Davidson of ShelfieTalk who recommended that I start with book talks. 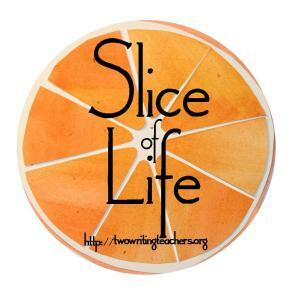 During a conversation over Voxer, she is located in New Brunswick, Canada and I am here in Upstate NY, Jill shared that in her experience, going into classrooms to do book talks opens doors for collaboration. When I approached 11th grade teacher, Ross Marvin about doing books talks with his students, he enthusiastically agreed. 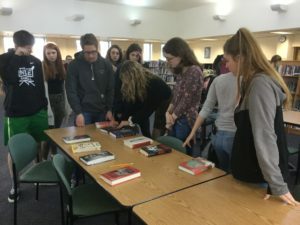 We had just attended a day-long workshop with Kelly Gallagher and Penny Kittle as a department and their endorsement of book talks made this an opportune time to bring them to high school classrooms in my district. This was my first time collaborating with Ross. When we met before the talks, he provided guidance with book selection by naming which texts were likely to hook individual readers. 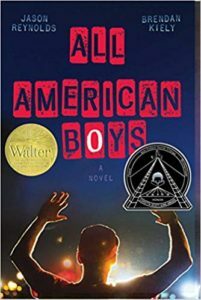 A Long Way Down by Jason Reynolds and Hey, Kiddo by Jarrett Krosoczka appealed to some classes while the The 57 Bus by Dashka Slater and The Sun is Also a Star by Nicola Yoon excited others. While I lead the book talks, this was very much a collaborative process. Ross interjected and helped guide the conversation. He demonstrated genuine excitement for the books that I shared and talked to the kids about them afterwards. After the book talks, our conversation lead to plans for future work around summer reading and other lessons this spring. Another collaborator in this process was Sandy Berger, the school librarian. She helped guide which books to talk; pulling them from the library shelves so that they were readily available to students. After the talks, Sandy was eager to learn which books appealed to students so that she could order more for the library. Upon seeing that so many students wanted to check out the books we talked, Ross came up with the idea of a raffle. We asked students to write down their names and the name of the book they wanted and at the end of the day, we drew names out of a hat to see who could take the book out first. I typed up a list of students who expressed interest in the book and placed it inside cover. My hope is that the book will be passed along to those students next forming a sort of “book relay”. The week before the book talks, I attended an amazing workshop with Dr. Christine Dawson on Visual Thinking Strategies (VTS). She demonstrated the strategies with one of the books I talked, All American Boys by Jason Reynolds and Brendan Kiely. After the workshop I thought, what better way to sell a book than to guide students to use VTS to analyze the cover and a poem in the opening pages? “He is getting arrested,” one student responded. “He is at a concert,” another added. “What do you see that makes you say that?” I asked. “Well there are red lights in front of him. Police cars have red lights,” students replied. The conversation continued leaving students anxious to find out if their predictions were correct. Needless to say, the book was a hit and many students filled out a ticket to read it. For more on Visual Thinking Strategies check out Dr. Dawson’s article, “Visual Thinking Strategies in the English Classroom: Empowering Students to Interpret Unfamiliar Texts” in Voices in the Middle. Vol 26, September 2018. Buzz about the books spilled into the next day’s English Class. Ross shared that students arrived to class anxious to learn who “won” the book first. To me, this is a testament of the power of book talks to generate excitement about reading for all readers. When planning the book talks I deliberately made them simple so that students might be encouraged to do them. Imagine if we make book talks a regular part of the classroom routine?! I believe that talking books can create a culture of reading in a class and maybe even a school. You’re doing incredible work. How wonderful that you were able to connect with Jill from ShelfieTalk. (Side note: I grew up near New Brunswick. I had no idea that was where she was from.) She’s brilliant… as are you. Thank you, Stacey. That means a lot coming from you! How funny that you and Jill have that connection! She has been a wonderful mentor to me! I work as a K-5 literacy coach but I am also certified for high school English – it is what I initially thought I wanted to teach (composition and all, you know). Although I landed at the elem level, I’ve tutored high school kids for years and found it a delight. What a way to create energy around reading, with the book talk approach and the raffle! Approaching it as an invitation to talk and share – two things this age group naturally loves to do – is key. And they love being heard. You have such an exciting adventure ahead of you! For the record: I love everything by Gallagher and Kittle, and a couple of years ago went on a field trip with 4th to a storytelling festival where Krosoczka was featured – he talked to the kids about ideas for stories and illustrations, and gave away a signed sketch of the Lunch Lady. You will inspire these kids – you’ve already begun!